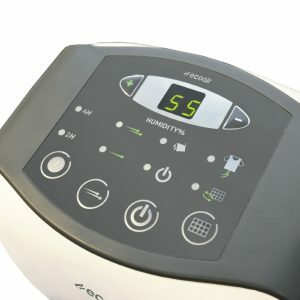 Home » Refrigerant Dehumidifiers » EcoAir DC12 Review – Is This the Best Portable Dehumidifier? 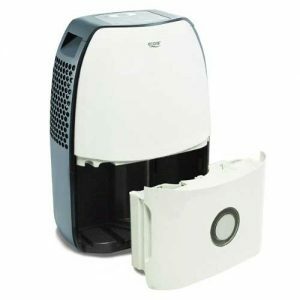 The EcoAir DC12 compact portable dehumidifier is a stylish machine with a surprisingly large 3.5 litre water tank. But how effectively does this refrigerant dehumidifier remove water from air? And does it provide value for money? Keep reading our EcoAir DC 12 review to find out. The EcoAir DC12 dehumidifier is a powerful model with a range of useful features. It also has a surprisingly large capacity considering its size. 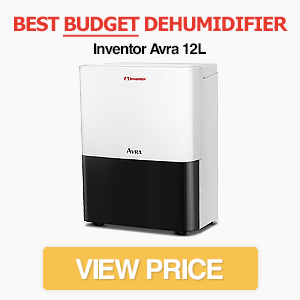 If you're looking for a small home dehumidifier that provides great value, the DC12 is one of the best options. 5 EcoAir DC12 Vs DC18 – What’s the Difference? At first glance, the DC12 is an attractive dehumidifier with a stylish curved design. While appearance isn’t the most important factor, it’s a relief to find a machine that doesn’t have the classic “white square block” appearance of most dehumidifiers. To remove water, air is “inhaled” through the back of the machine and expelled out the right side. It’s important to maximise airflow around a dehumidifier, so you need to make sure the air isn’t blown directly into a wall. This usually wouldn’t be a problem, but if you want the dehumidifier for a specific location make sure it suits the vent arrangement. The DC12 has a simple filter for removing dust from the air before it enters the machine. This is effective at trapping dust but won’t purify the air or remove odours. While it’s not surprising that a model in this price bracket doesn’t come with an ioniser for air purification, it’s still a shame that only a basic filter is included. Every couple of weeks you’ll need to clean the filter as it becomes filled with dust. This is located at the back of the DC12, but is easy to unclip. You can use a brush to remove dust, but we recommend a vacuum cleaner to remove any material that might reduce the efficiency of the machine. The 3.5 litre water tank is located at the front of the machine and is easy to remove. Surprisingly, the DC12 comes with a large 3.5 litre water tank. This is considerably larger than many other dehumidifiers. If you want to minimise how often you’re required to empty the dehumidifier, the DC12 is one of the larger options in its price range. The water tank can be removed from the front of the machine. If you forget to replace the tank, an alarm sounds for approximately 10 seconds. While it’s great that the tank can be removed without moving the unit, it can be difficult to empty without spilling. EcoAir calls the DC12 a compact machine – but with dimensions of 35 x 49 x 22 cm and a weight of 11kg, it doesn’t quite meet our “small” or “portable” requirements. It’s not huge, but some of the small dehumidifiers we’ve reviewed are smaller. If you need a dehumidifier that has a large water tank yet doesn’t take up too much room, however, then it’s a great option (although there needs to be a gap between the wall and the back of the machine). Considering it’s been designed to be portable, we’re pleased that castor wheels are built-in. These make moving the machine between rooms much easier – especially as it weighs over 10kg. It also has two recessed carry handles, although we would have liked proper pull out handles. The filter is located at the back of the dehumidifier and needs to be cleaned every 2 weeks. 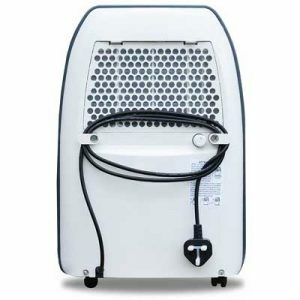 The EcoAir DC12 is a refrigerant dehumidifier. This means it’s most effective in warm and humid conditions, such as those found inside a British home. In ideal conditions the DC12 has an extraction capacity of 12 litres per day. In reality, this is only achievable with a temperature of 30 degrees Celsius and 80% humidity. Even so, it has excellent water extraction and can quickly reduce the humidity in your home. We’ve read many EcoAir DC12 reviews from buyers. Most are impressed with how much water it can extract. While the exact amount of water depends on the humidity and temperature, you can expect it to remove a litre or two from a large room overnight if you have a lot of moisture in your home. It struggles in cooler temperatures though – like most refrigerant dehumidifiers. For this reason, we don’t recommend it for garages or conservatories. 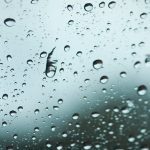 There are other EcoAir dehumidifiers better suited for these conditions. With a capacity of 12 litres, the DC12 is ideal for flats and small homes (up to three bedrooms). If you have a larger home or a building that suffers with severe damp, the more powerful DC18 might be a better option. As you might expect from a refrigerant dehumidifier, the DC12 isn’t quiet when on full power. With a noise rating of 43dB on the higher fan setting, it’s probably too loud to have in the bedroom overnight. Even so, its lower fan setting is much more bearable. At 41dB, it’s not too distracting when in the same room. It’s also probably quiet enough on the lower fan setting to watch TV. Judging the energy efficiency of a dehumidifier is difficult, as the running costs vary depending on the environment and how often the machine is used. Overall, the EcoAir DC12 running costs are relatively low, with the machine using around 220W when on high speed mode. You can reduce energy costs by using the lower speed mode, although the difference in power is small. Keep in mind that you’re unlikely to need to run the dehumidifier at all times. It can rapidly reduce humidity, so most people have it on for period of time each day (or when needed). The DC12 includes a range of features to help manage air conditions in your home. 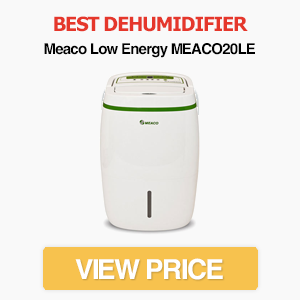 Considering this is one of the lowest priced EcoAir dehumidifiers, we’re impressed by the quality of features and settings the company has managed to pack in. Like many of the best dehumidifiers, the machine includes a laundry drying function. EcoAir claims this reduces clothes drying time to between two to four hours, although this depends on the type of clothing (heavier items such as jeans require longer). If you’ve had enough of waiting 24 hours or more for your washing to fully dry, the laundry function could be very useful. Automatic shut-off – when the tank is full the DC12 switches off automatically to prevent overflowing. Automatic restart – the machine automatically restarts using its previous settings if there is a break in power. Continuous drainage function – if you don’t want to worry about emptying the dehumidifier, the drainage function could be useful. A pipe is included with the model although this is only one metre long. Automatic defrost – the longer a dehumidifier takes to defrost, the more energy it wastes. That’s why the DC12 includes an auto-defrost function. Note: The DC12 comes with a standard two year warranty from EcoAir. It has a simple LED display for humidity, several notification lights and a variety of settings. The DC12 comes with a “Touch Button” control panel and basic LED display. We’re not sure why EcoAir describes this panel as “Intelligent,” but it’s simple to use and provides all the information you need at a glance. We would have liked to have seen a more advanced display for monitoring humidity, but considering the price range it does the job. The most important buttons are for adjusting target humidity. These can increase or decrease humidity in 5% increments, giving you precise control over the interior conditions of your home. This value for humidity is always displayed clearly so you know what the machine is aiming towards. The humidity can range between 35% to 80%. If you want the machine to switch off after a certain amount of time, there are easy-access buttons for two and four hour timer modes. Timer modes are common on most dehumidifiers, but are useful when you need to quickly dry your home. They are also great for saving energy by only running the machine for a fixed period of time – especially if you want to leave it on while you’re out. The only downside is that the machine doesn’t include an eight hour timer. There are various warning lights on the control panel. These include a “full tank” and “clean filter” lights. While this is a minor feature, we like how the DC12 reminds you when it requires basic maintenance to keep it running smoothly and efficiently. You can switch between fan speeds using the second button. The lower fan speed is useful if you want to reduce noise output or just want to save energy, but it will take longer to remove moisture from the air. The higher fan speed is best for quickly drying a room. We think the DC12 provides exceptional value for money. It’s quick to reduce humidity in a room or small home and has a range of useful features. But the large water tank makes it really stand out from the crowd – especially as it’s also a relatively compact model. EcoAir DC12 Vs DC18 – What’s the Difference? The DC12 and DC18 are very similar models. In fact, the only real difference is in the capacity. As the names suggest, the DC12 has a maximum capacity of 12 litres per day, while the DC18 can handle 18 litres per day. Both models have the same size water tanks and include identical control panels. A side effect of this difference in capacity is that the DC12 is 2dB quieter. This might not sound like much, but remember that the decibel scale is logarithmic so this is a noticeable difference. The DC12 is also 2.5 kilograms lighter so it’s easier to carry. 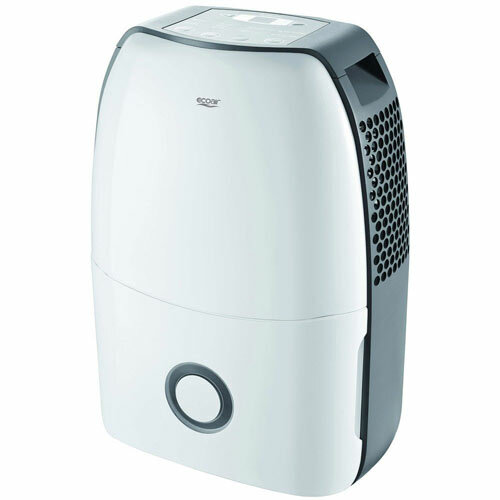 The EcoAir DC12 dehumidifier is an excellent option for small houses and flats. It’s great at extracting water at room temperature and above. The machine is also relatively quiet, compared to other refrigerant dehumidifiers, and has a range of useful features. We also like that it has a large 3.5 litre water tank despite the relatively slim design. We don’t recommend it for garages or rooms without heating though. For cooler conditions your best bet is to buy a desiccant dehumidifier.